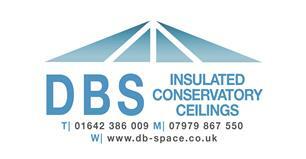 DB-Space - Roofer, Windows/Doors/Conservatories based in Middlesbrough, Cleveland. Welcome to DB-space checkatrade page. By fitting one of our PVC-u insulated ceilings, we can instantly transform conservatories into spaces which can be used all year round. Keeping your conservatory cool in summer and warm in winter. The new ceiling reduces the noise of rain and cures many condensation problems. Our internal roof conversions are installed using the latest technology in lightweight aluminiun multi-foil insulation consisting of 19 layers, foam membranes and wadding quilt. It works by reflecting up to 95% of radiant heat back into your room during the winter and through summer reflecting excessive heat out. It also works as an airtight envelope, ensuring to combat condenstion problems. The internal ceiling is then cladded with a lightweight, tounge and grooved effect, maintenance free UPVC satin gloss finish, to reflect the light and keep the room bright and airy. They normally take only one day to install, with no mess and no fuss, with installation to take place whatever the weather. Besides enhancing your conservatory appearence, our internal conversions will help keep your conservatory warmer in the winter months and cooler in the summer months saving you money on your energy bills. We at db-space have converted every size and shape conservatory there is. We have the confidence and ability to undertake any job with our finishing and detail second to none. We dont have a showroom but we do have lots of happy customers who are always happy to accept a visit from any prospective customers so please dont hesitate to call. We are City and Guilds regestered and all out work comes with a 5 year guarantee.